Measuring made easy, measuring your project by just taking a digital picture. 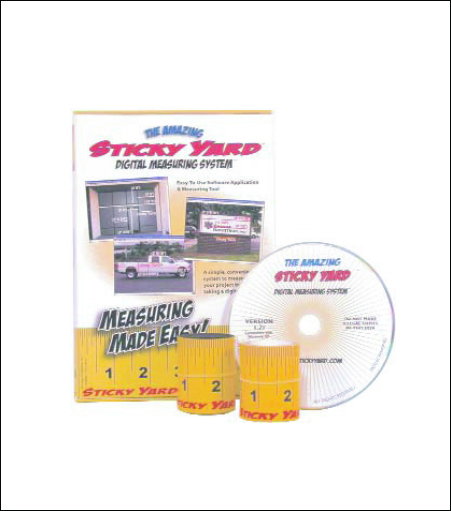 Sticky yard™ system includes one 36" adhesive sticky yard™, one 36" magnetic sticky yard™, one 6" sticky yard™, one 6" magnetic sticky yard, sticky yard™ digital measuring system software. Place the Sticky Yard™ on a vehicle, window or boat. Take a digital photo. Download the photo to your computer and open it in the Sticky Yard™ Digital Measuring System software. Zoom in on the Sticky Yard™, then click on each end to scale the image. Click on one end of the measurement you want to take, and then the other end. The Sticky Yard Digital™ Measuring System software draws the lines and stamps the measurements right on the image. Allows you to save the image as a JPEG.